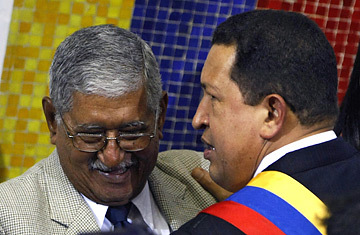 Venezuelan President Hugo Chavez, right, talks to his father Hugo de los Reyes Chavez, left, at the National Assembly in Caracas. On a veranda at the governor's residence in the southwestern Venezuelan state of Barinas, Narciso Chavez stands up, lifts a leg and stomps the ground several times, laughing. He is demonstrating the country-and-western dance moves he learned years ago at bars near Daytona Beach. Nacho, as he's nicknamed, studied English in Florida, had a son with his American girlfriend in Ohio, and claims he's still the best English teacher in his hometown. More to the point, perhaps, he's the younger brother of President Hugo Chavez, which may be how he came to be stomping around the governor's mansion. The most important offices in the President's home state are held by members of the first family, starting with the governor, the President's father, Hugo de los Reyes Chavez. A younger brother, Argenis Chavez, is Secretary of State; and another, Anibal Chavez, is mayor of Sabaneta. A third brother, the oldest, Adan Chavez, has long been a member of Hugo's cabinet in Caracas, first as his chief of staff and now as education minister. The city of Barinas, the state capital, has long been defined by the vast, rough-and-tumble plains, or llanos, and their cattle culture, that encircle it. Much of the city's gossip, however, revolves around the Chavez clan. It's not uncommon to see red graffiti splashed across street walls in Barinas warning, "If they try to kill Chavez, death to the oligarchy." And anecdotes about young Hugo, accurate or not, flow freely. Joaquina Frias, the president's 73-year-old aunt, sits on the porch of her small house in the sweltering heat in Sabaneta, the Barinas town where Hugo Chavez was born. When Hugo was a child, she says, he told other children that he would become President, and when he did he would fix a broken water fountain in front of their school. Others, like childhood friend and neighbor Flor Figueredo, don't recall Chavez showing much political ambition back then. Except once. "He made a comment that with there being so much oil in Venezuela, look at how the streets were," she recalls. "And I said yes, Hugo, look at how depleted this town is. 'This country has to change directions,' he said." Change directions it certainly did after Chavez won the presidency in 1998. Nine years later, the United States is the main enemy and the President aims to consolidate his revolution by overhauling the constitution for a second time, ending presidential term limits, making it easier for the state to expropriate private property, and allowing the government to detain citizens without charge in a state of emergency. And the changing times have changed the fortunes of the Chavezes, leaving their humble beginnings behind to become the most powerful family in the state. The man who runs Barinas, local journalists say, is not the governor, Hugo's aging father, but rather his brother Argenis, who, as secretary of state holds a position that doesn't exist anywhere else in the country. Argenis, too, delivers anti-Bush harangues, but shorter and less spontaneous than his more famous brother's. And his audiences are smaller. At an event near Barinas commemorating independence hero Simon Bolivar's birthday, Argenis walked down a red-carpeted aisle and told a crowd seated on a high-school basketball court that Venezuela has an "ineludible commitment to march towards the socialism of the 21st century under the maximum leader, Hugo Chavez Frias." Nacho has his own problems with Washington, saying tension between the two countries prevents him from visiting his son. "If the CIA sends someone to kill Chavez, they'll regret it," says Nacho. But he also says his American friends taught him the importance of giving, which he now sees as a pillar of socialism. "The American people are nice. They are good people. And we don't have anything against them. Some things that the government does against us, that's the problem." The small political opposition that has managed to survive in Barinas complains that the Chavez family lives like royalty. "The new leaders are the representatives of the new oligarchy," says opposition leader Leonardi Meza. Although there has been government corruption in Barinas, no evidence has surfaced implicating the family. In 2006, a multimillion-dollar embezzlement scheme was uncovered at the Ezequiel Zamora sugar-processing complex still construction near Sabaneta despite having been slated for completion in 2005. Only lower-level officials have been charged in the case. The President's kin is quick to dismiss any claims that they are living beyond their means thanks to their favorite son. Hugo's mother, Elena, sits in her small office at the children's foundation she runs, surrounded by a pictures and a wooden bust of Hugo. On her desk is a piece of paper she says she reads every day, titled, "Messages from Jesus." Mrs. Chavez, known across town as DoÓa Elena, wears plenty of makeup, a white blouse with black polka dots and her hair in a bun. Her husband, the governor, is preparing for a trip to Cuba, she says, but she would stay home because neither she, nor her two Maltese dogs, liked to travel. DoÓa Elena recounted how, as a kid, Hugo sold papaya candies made by his grandmother, who raised him and Adan, to help support the family. She said it shamed him to see friends whose families had nothing, and that was why he emphasizes social programs as President. "I continue with the same humbleness," she says. "In my heart I'm the same humble woman as before. Of course I have to change my clothes. I have to put on clothes more appropriate for the position. But I feel that I'm the same. Humble. If it weren't that way then I wouldn't be seeing you."